According to an article in The Houston Press, a Texas man who was injured on the job has been in a eight-year fight with the insurance company to get his worker's comp benefits, but to no avail. The injury happened in 2005, when the injured man, a truck driver, was struck by a drunk driver late at night. The drunk driver died, and the injured man suffered severe injuries from the accident. Injuries that he's still suffering from today. There is a Court order ordering the insurance company to pay him his benefits, and many doctors have confirmed that he has serious mental and physical injuries from the accident that are still preventing him from working. Nevertheless, they refuse to do so because they say he has no physical or mental issues. Hopefully this is not the end for this injured worker, and his case (likely headed to the Texas Supreme Court) is settled in his favor. Here at Donahoe Kearney, we see cases where injured workers in DC, Maryland and Virginia don't get the benefits they deserve all the time. Whether it's because of waiting too long, or an insurance company that just doesn't want to pay up, this situation is much more common than most hard working people imagine. Sometimes, they won't pay unless you go to the doctor - read more about why here. And, that's why we fight for you everyday. That's why it's important to get off on the right foot so that you know what you need to do, and when you need to do it. We've written a book all about this. 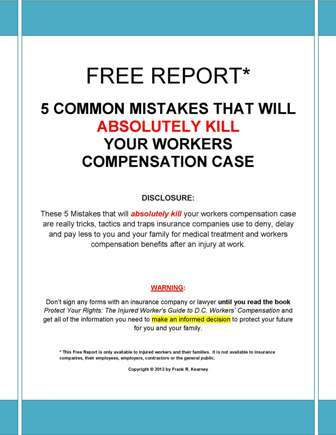 It's called Protect Your Rights: The Ultimate Guide to D.C. Worker's Compensation and it will tell you what you need to know to avoid disasters like the one we've seen here in Texas. You can order it here, or by calling us at 202-393-3320. A live person will answer that can get you help right away.